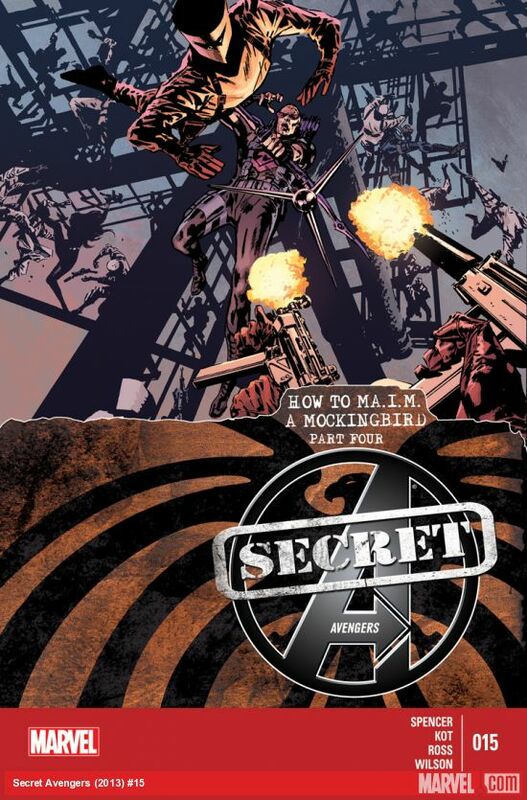 We are in the back half of Nick Spencer and Ales Kot's “How to MA.I.M. a Mockingbird.” And with the All-New Marvel NOW! 's shadow looming just two months away, it is time to start wrapping nearly a year of story up. But will it resolve in a way that has made a long-term investor like me satisfied? The story opens with Maria Hill and M.O.D.O.K. continuing and perhaps finally finishing their dance. And on A.I.M. Island, Nick Fury Jr. and team attempts to escape capture. And all this leads to lots and lots of fighting! No Agent Coulson! I am just saying, we are Coulson free. I think he should be helping out Director Hill in her talks with M.O.D.O.K., but hey I'm just a AC fan kids! Maybe he is just off camera trying to get Deadpool his dirty dirty Monies! I know this issue is leading us to a conclusion and I am hoping big payoffs next issue. And this better especially be true in Mockingbird's story. But in this episode (issue) it was just a lot of shooting and some hitting. The best moments for me are reserved for Black Widow, who will pilot the submarine that can be run by one person or die trying. Silly villains, leaving their toys around in the most convenient places for escaping heroes. Oh I guess second place should go to Hawkeye for understanding how his comedy can help discharge a tense situation. But honestly for me this story got confusing, like a Bourne movie action sequence. There is a lot of action and a bunch of it is told not in full frames but what I would call thumbnails. Artistically it may be interesting but for someone who looks to a story in a straight line, it got a little confusing. Daisy Johnson is still MIA! 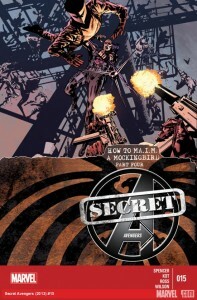 Secret Avengers #15 may be my least favorite of this series so far. I will admit it could be me feeling the external pressure to wrap this story up with April being the next launch point for readers. But I need to know what is going on with some characters who have just disappeared! And I feel like the action could have been condensed to give us a little more character development.